Since the decline of plasma, OLED TVs have been at the top of the pile. Yes, they're expensive, but because of the way an OLED panel's pixels emit their own light rather than relying on a backlight they can generate what are referred to as 'perfect' blacks where their pixels turn off entirely. We'll outline the pros and cons of each of our OLED TVs in our expert buying guide. Rest assured that all of them are fantastic sets, and that you'll be getting a great TV experience no matter what your budget is. In contrast to OLED TVs, modern LCD TVs tend to rely on an LED backlight (leading to them sometimes being referred to as 'LED TVs') which allows for a certain amount of contrast between light and dark parts of an image, albeit nowhere near as much as OLED panels allow. If you're buying an OLED TV today, then you have much more choice than you would have had in previous years. Multiple manufacturers have now embraced the technology, including Panasonic, Sony, and Philips in addition to OLED stalwarts LG. The problem is that all of these manufacturers are using panels made by LG's subsidiary LG Display. This means that they're all fundamentally using the same display hardware to generate an image. The good news is that this means it's hard to go too wrong when you're buying an OLED since the differences between these sets ends up being fairly minimal in the grand scheme of things. The single biggest differentiating factor between these TVs is sound. Some of the sets feature hefty front-facing soundbars, while others have pretty puny downward-firing speakers mounted on their rears. Either spend more upfront on a TV with a better set of speakers, or else be prepared to buy an external speaker system or soundbar at a later date if you want half-decent sound. In addition to sound there are also some more minor differences with how each TV processes its picture before it's sent to the panel hardware to display. Some sets are better at handling non-4K HDR content, while others excel at getting every bit of detail out of pristine Ultra HD source material. These different levels of picture processing also mean that input lag can vary between sets, meaning some are better suited to gaming than others. LG produces a range of OLED televisions, and we think the B7 series is the best value of the lot of them. The reason? While there are often thousands of pounds of difference between the models, their picture quality is actually exactly the same. Whether you spend just over a thousand pounds on the B7 or several thousand on the W7, you'll get exactly the same visual experience. Where the sets differ is in their sound quality, and the B7 has the worst of the lot. If you're going to opt for this TV then be sure to budget some money for an external soundbar or set of speakers. (If you like the sound of an LG OLED but would rather have better sound built in, then check out the LG E7 below.) But outside of its sound quality you're getting an absolute bargain with the B7. Its input lag is low enough that it makes for a fantastic gaming TV, and its WebOS smart TV operating system is fast and easy to use. If you want to see what all the OLED fuss is about, then LG's B7 is a fantastic entry point. If you want to pay more for your OLED TV experience then Sony's A1 is a fantastic step-up option. The headline feature here is the set's ability to 'upscale' non-4K HDR content to make it look almost as good as footage filmed natively in the newer format. This is a pretty important feature when you consider that the vast majority of films and TV shows are going to be in HD/SDR for the foreseeable future. Elsewhere there's lots more to love about the A1. It's got a hi-tech sound option that vibrates the front of the screen like a speaker to create sound, and although Android TV can be a little sluggish at times it's nevertheless packed full of functionality. The only slight downside to this set are the higher levels of input lag, but these will only be an issue if you plan on using it for very fast-paced games. If you are looking out for a TV that's just for gaming, check out our pick of the best 4K TVs for gaming. If you like the look of LG's B7 but don't want to have to invest in an external sound system then the E7 is an absolutely fantastic option. While the B7 relies on downward-firing rear-mounted speakers, the E7 is equipped with a chunky forward-facing soundbar. It's less sleek as a result, but with sound performance like this you're unlikely to care too much. Otherwise this is exactly the same TV as the one we've placed at the number one spot in our list complete with the same great picture quality and interface. Panasonic's EZ1002 series of televisions is about as good as OLED TVs get. These sets (available in either 65- or 77-inch variants) have phenomenally accurate colours, meaning that you're really seeing content exactly as was intended in the editing suite. Beyond picture quality, the EZ1002 is also equipped with a pretty hefty soundbar that provides a great level of audio clarity to complement its visuals. The one downside here is that the EZ1002, unlike LG and Sony's models, does not and will not support Dolby Vision, the enhanced HDR standard from the veteran AV company. Instead, it will be receiving support for HDR10+ via a forthcoming firmware update. Initial comparisons suggest that HDR10+ offers a very similar level of performance to Dolby Vision, but it will be up to content creators to support it, and this part of the equation is still something of an unknown. 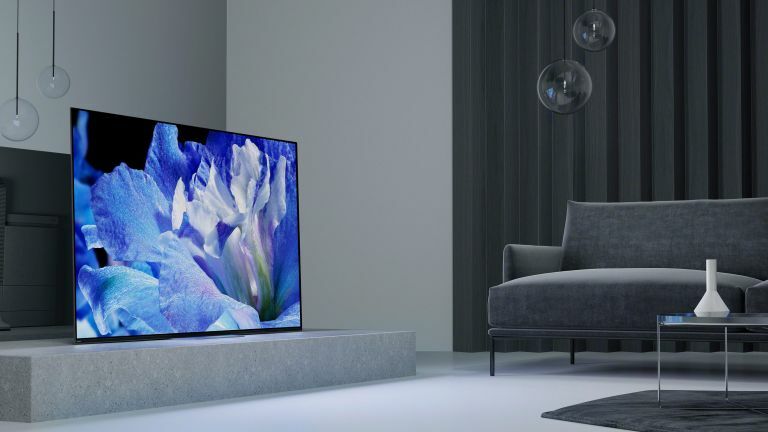 The main reason to opt for the Philips 55OLED873 (which was confusingly renamed from the 55POS9002 in 2018) over the other OLEDs on this list is its Ambilight, which uses three rows of LEDs to project light onto the wall behind it. The idea here is that this light reduces the eye strain you experience when you're watching a TV in a darkened room, but if we're honest the main appeal for us is mainly that it looks nice in all the ways a light show should. Thankfully, much the same can be said about the pictures on the screen as those that surround it, with nice natural colours and a fantastic level of detail. Its sound isn't quite up there with the likes of the LG E7, but with the delights of Ambilight on board you might just not mind.